really like this one and love all the moon pictures…well done…. 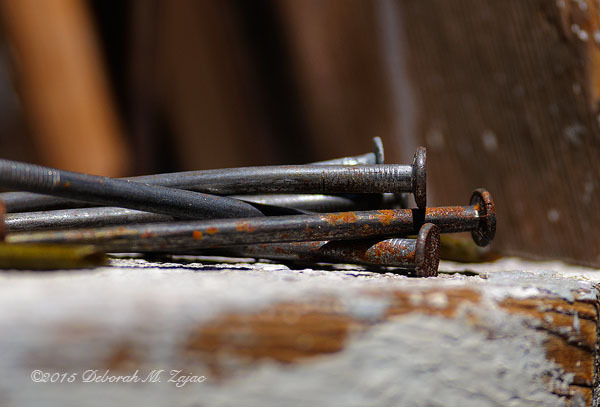 excellent closeup – rusty nails made an interesting composition! Thank you Dan for the comment! Unfortuately, as I was beginning to write my thank you reply #1 Grandson drove his dump truck over my keyboard and deleted your comment! I couldn’t get to the UNDO button fast enough. I’m sorry! pretty Cool Deborah, it shows you are looking at them with different eyes than most of us. A lot of our yard was overgrown before we moved into it and we are slowly getting it cleaned up, my wife dug into a mound and pulled a big wheelbarrow full of nails out of it. I never thought of taking a photo. Shame on me. Next time you see some nails or something similar you’ll probably look for a composition now. I hope so! 🙂 Thank you very much Jodi!